Almost everybody knows someone who has been affected by some degree of hearing loss. While hearing impairment can be the result of heredity, it also is a natural and graduated result of the aging process and/or noise exposure. 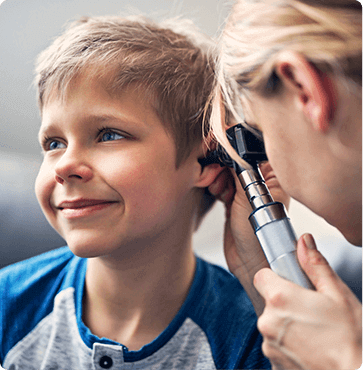 At Austin ENT Clinic Pediatric & Adult Care, we deal with people of all ages who are interested in finding out more about hearing loss, either for themselves or for a family member. It’s not uncommon for people suffering from hearing loss to be defensive or in denial about it. Our goal is to help you learn more about the hearing process, hearing loss, and the scientific advances the hearing community has made in the last several years to bring hearing back to the hearing impaired. We foster the tradition of better hearing through education, technology, and customer service. We are an Austin ENT Clinic is a full-service practice that was founded to help members of our community get more from a local hearing care provider. Our comprehensive services include hearing testing, hearing aid evaluations, and hearing aid sales and repair. We offer an array of hearing aids and devices to fit the needs of all our patients. A hearing aid is a small electronic device that you wear in or behind your ear. It makes some sounds louder so that a person with hearing loss can listen, communicate, and participate more fully in daily activities. A hearing aid can help people hear more in both quiet and noisy situations. However, only about 1 out of 5 people who would benefit from a hearing aid actually uses one. The digital revolution has made a huge impact on the way hearing aids look, feel, and work. They can be so small that they are virtually invisible, so "cool" looking that you will want everyone to see them, and so natural sounding that they mimic the way you used to hear before you experienced hearing loss. Hands-free technology automatically adjusts to your listening environment... whether you are on the phone, in a crowd, or in wind. There are so many options available - economy, basic, advanced, and best. Each level offers digital hearing solutions based on your level of hearing loss, lifestyle, and budget. Our audiologist will review your choices and help you determine which is best for your lifestyle and budget. A cochlear implant is a device that restores a sense of sound for people with severe to profound hearing loss. The implant system consists of the internal implant and externally worn equipment. The implant is surgically placed under the skin with an electrode array inserted into the inner ear. The external equipment is worn similarly to a hearing aid and includes a microphone, sound processor, and transmitter. The microphone picks up sound from the environment. The sound processor is a tiny computer worn over the ear that takes the sound and converts it into digital information. The transmitter receives signals from the sound processor and sends them to the internal implant. The implant converts the signal from the transmitter to electric impulses. The electrode array sends the impulses to the auditory nerve. The auditory nerve sends the signals to the brain. Cochlear implants are different from conventional amplification, such as hearing aids. Using state-of-the-art technology, a cochlear implant bypasses the damaged part of an ear and sends electrical signals directly to the brain via the auditory nerve. By bypassing the damaged part of the ear, the cochlear implant is able to provide sound detection across all pitches improving signal clarity. The use of a cochlear implant alone, bilaterally, or bimodally with a hearing aid in the non-implanted ear, improves speech perception, significantly allowing recipients to become more active participants in their daily activities. A cochlear implant candidate experiences severe to profound hearing loss bilaterally, and/or significantly impaired speech recognition. Expanding indications for cochlear implantation include ski-slope hearing loss and single-sided deafness. If hearing aids are providing limited benefit, one of our ENT specialists and audiologists can evaluate you to determine if you are a candidate for a cochlear implant. The evaluation includes a medical assessment, audiological testing with and without amplification, speech perception testing, and CT scan. Speech-language evaluation and psychological evaluation may also be required. A meningitis vaccination is required of all cochlear implant recipients. Cochlear implants are approved by the FDA for adults and children as young as 12 months of age. Austin ENT Clinic offers all FDA-approved cochlear implant devices, including electroacoustic stimulation (hybrid) cochlear implants. A hearing aid magnifies sound vibrations entering the ear. Surviving hair cells detect the larger vibrations and convert them into neural signals that are passed along to the brain. The greater the damage to a person's hair cells, the more severe the hearing loss, and the greater the hearing aid amplification needed to make up the difference. If you think you might have hearing loss and could benefit from a hearing aid, visit Austin ENT Clinic. One of our otolaryngologists will evaluate the cause of your hearing loss. One of our audiologists will identify and measure your hearing loss to assess the type and degree of loss. She will then select and fit you with an appropriate amplification device or assistive listening device as needed. There are three basic styles of hearing aids. They differ by size, their placement on or inside the ear, and the degree to which they amplify sound. Behind-the-ear (BTE) hearing aids consist of a hard plastic case worn behind the ear and connected to a plastic ear mold that fits inside the outer ear. The electronic parts are held in the case behind the ear. BTE aids are used by people of all ages for mild to profound hearing loss. Open fit behind-the-ear aids fit behind the ear completely, with only a narrow tube inserted into the ear canal, to enable the canal to remain open. For this reason, open-fit hearing aids may be a good choice for people who experience a buildup of earwax, since this type of aid is less likely to be damaged by such substances. Some people may prefer the open-fit hearing aid because their perception of their voice does not sound “plugged up.” Open Fit BTE aids are used by adults for mild to moderately-severe degree of hearing loss. Receiver-in-the-canal (RIC) or receiver-in-the-ear (RITE) hearing aids include a hard plastic case worn behind the ear and connected with a thin wire to a small plastic ear piece that fits inside the outer ear. The RIC or RITE aids are sleeker and smaller because the actual receiver of the hearing aid, which sends sounds to the ear canal, sits directly inside of the ear canal with the small ear piece on the end of the thin wire. RIC or RITE aids are used by adults for mild to severe degree of hearing loss depending on the size of the ear piece that sits in the ear canal. The greater the degree of hearing loss, the thicker and larger the plastic ear piece that sits in the ear canal. In-the-ear (ITE) hearing aids fit completely inside the outer ear and are used for mild to severe hearing loss. The case holding the electronic components is made of hard plastic. ITE aids usually are not worn by young children because the casings need to be replaced often as the ear grows or changes in shape, for example, if one gains or loses weight. Because they are small, canal aids may be difficult for a person to adjust and remove. In addition, canal aids have less space available for batteries and additional features. They usually are not recommended for young children or for people with severe to profound hearing loss because their reduced size limits their amount of power and volume to help the patient hear. Analog/programmable hearing aids have more than one program or setting. An audiologist can program the aid using a computer, and the user can change the program for different listening environments – from a small, quiet room to a crowded restaurant to large, open areas, such as a theater or stadium. Analog/programmable circuitry can be used in all types of hearing aids. Analog aids usually are less expensive than digital aids. Digital aids convert sound waves into numerical codes, similar to the binary code of a computer, before amplifying them. Because the code also includes information about a sound's pitch or loudness, the aid can be specially programmed to amplify some frequencies more than others. Digital circuitry gives an audiologist more flexibility in adjusting the aid to a user's needs and to certain listening environments. These aids also can be programmed to focus on sounds coming from a specific direction. Digital circuitry can be used in all types of hearing aids. Other features to consider include parts or services covered by the warranty, estimated schedule and costs for maintenance and repair, options and upgrade opportunities, and the hearing aid company's reputation for quality and customer service. Can you make adjustments and provide servicing and minor repairs? What instruction do you provide? Become familiar with the features of your hearing aid. With your audiologist present, practice putting in and taking out the aid, cleaning it, identifying right and left aids, and replacing the batteries. Ask how to test it in listening environments where you have problems with hearing. Learn to adjust the aid's volume and to program it for sounds that are too loud or too soft. Work with your audiologist until you are comfortable and satisfied. What new types of aids are available? A bone-anchored hearing aid (BAHA) is a small device that attaches to the bone behind the ear. The device transmits sound vibrations directly to the inner ear through the skull, bypassing the middle ear. BAHAs are generally used by individuals with middle ear problems or deafness in one ear. Because surgery is required to implant either of these devices, many hearing specialists feel that the benefits may not outweigh the risks. Researchers are looking at ways to apply new signal processing strategies to the design of hearing aids. Signal processing is the method used to modify normal sound waves into amplified sound that is the best possible match to the remaining hearing for a hearing aid user. Researchers funded by the National Institute on Deafness and Other Communication Disorders (NIDCD) also are studying how hearing aids can enhance speech signals to improve understanding. Use our online form to request an appointment or call 1-800-876-EARS (3277) to discuss your personal situation and how Austin ENT Clinic can help you. We look forward to meeting with you soon.